For the beginner painter, acrylic rock painting is great medium since it’s water-soluble, dries quickly, and is versatile. Acrylic, itself is a plastic polymer that can be painted on any surface as long as it’s not oily or waxy. 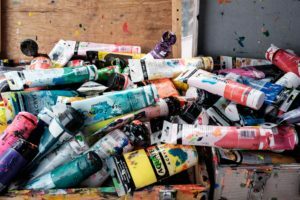 Also, unlike oil-based paints, acrylics can be used devoid of any toxic solvents and can be easily cleaned with just soap and water, minimizing the messy outcomes of your work area. A great feature with acrylic rock painting is that, if you make a mistake, you can just let it dry before painting over the dry part without destroying or having to repeat the artwork, it’s such a forgiving medium and well suited for beginners. It can be thinned with water to be used as a watercolor for transparent effects such as washes and glazes. For starters, find an area with lots of natural light is best or a well-lit space to create your masterpiece. Acrylic Paint. Ensure you get the value for your money. It is better to consider the artist quality paint over the student quality paint as the hues are clearer and have less filler compared to the student ones. Overall, artist quality responds well to color and media mixing. Brushes. They should be of different shapes and sizes. 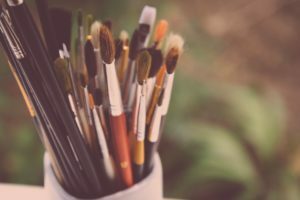 The general rule is that big brushes act on larger areas and as such used in loose painting styles while the smaller ones are for painting details over small areas. Painting support. This can be a rock, canvas, board, paper, etc. Since acrylic paint works on many kinds of surfaces; you won’t be limited in your options for support. Water. Have water available when you want to clean your brushes off while switching from color to color when doing acrylic rock painting. Even better, have two sets, one to rinse and the other to dilute paints and moisten brushes. Cloth rag or paper towel. To act as an eraser and to dab off brushes after rinsing. 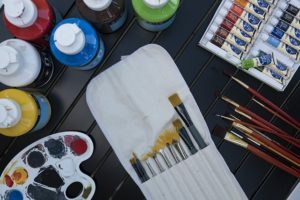 Check out a list of the best painting supplies for acrylic rock painting. What is your Painting’s Focus? The second step is deciding on what to paint. Look inwards or even outside, seek what you want to represent, or even your inspiration. Vividly discuss it, is it light, calm, aggressive? Once you decide, plan your composition around it, unless you are painting from an existing photograph, in which you don’t have to be 100% on the details. Additionally, you can alter the sizes, colors and even position of the things to suit your goal. You can even edit, add and move objects around to balance your composition more. Plan your layout first; make some preliminary sketches for use as a reference. The last thing you need to do is to add the highlights. They don’t have to be white; all they need to be is of a lighter hue of the primary object’s color. It works out even better when you step back and observe your painting from a distance; you can evaluate it and take note of areas you need to tweak or improve. Thousands of shades of colors can make it difficult to select which you desire. We understand that it’s possible to mix colors and achieve the rainbow colors from the primary colors, most of us feel it’s a tough task. However, you cannot carry every color paint tube available. The next section will talk about making up a good palette and to which you can mix all the colors you desire for your painted rock art. Obtain a tube of cadmium red medium (also red light and dark can work). Cadmium Red is warm and relatively opaque. From it, you can use it to mix and create new colors. Phthalo blue is a highly versatile color that is intense. When combined with burnt umber it gets very dark and, moreover, its high tinting strength ensures that only small quantities of it are needed to be mixed with white when creating lighter blues. It may take a little bit of practice, but many artists swear by this blue, you should definitely get it. A good substitute is an ultramarine blue. 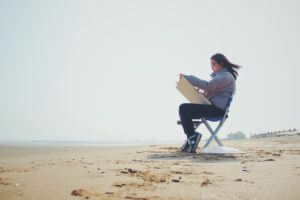 Starting off with a tube of cadmium yellow medium, you can create lighter hues simply by adding white to it. To darken the yellow, add complementary colors like purple. Adding black will result in an olive green instead of lighter yellow. This is an opaque, bright white with incredible tinting power. It’s a relatively opaque color; it must be added in small quantities until you have mastered its strength. Other options include ivory black. This is a warm chocolate brown that’s versatile and proves itself indispensable. It’s ideal for darkening the tone of other colors. Greens are relatively tricky to mix evenly unless you have a good sense of color hues. Yes, we know you can get orange by mixing red and yellow together. To save you time, mix it in a tube and have it ready to go. Or you can purchase a tube of cadmium orange. For more information, see our post on Beginner’s Rock Painting Supplies.